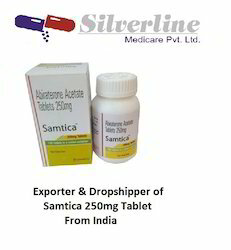 Providing you the best range of generic stivarga, nublexa 40mg tablet, abione 250mg tablets, abretone 250 mg tablet, abstet 250mg tablet and aceret 25mg capsule with effective & timely delivery. STIVARGA has not been used to treat children less than 18 years of age. STIVARGA can cause liver problems, which can be serious and sometimes lead to death. Your healthcare provider will do blood tests to check your liver function before you start taking STIVARGA and during your treatment with STIVARGA to check for liver problems. Tell your healthcare provider right away if you experience yellowing of your skin or the white part of your eyes, nausea, vomiting, dark urine, or change in your sleep pattern. Tell your healthcare provider about all the prescription and nonprescription medicines, vitamins, and herbal supplements you take. Avoid drinking grapefruit juice and taking St. John's wort while taking STIVARGA. We are the Leading Suppliers of Nublexa Tablets. Nublexa tablets comes as Generic of Stivarga at cost effective prices. Nublexa Tablets manufactured by Bayer contains Regorafenib as active ingredient in it. Regorafenib 40mg is an oral multi-kinase inhibitor developed by Bayer which targets angiogenic, stromal and oncogenic receptor tyrosine kinase. 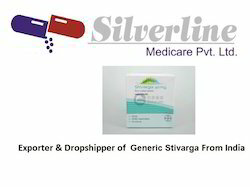 Buy Generic Stivarga Online from Mail Order Pharmacy at lower cost. 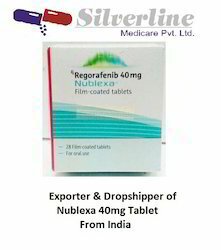 Nublexa Tablets Regorafenib available online at lower cost. 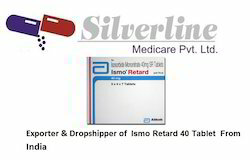 Order now Generic and branded medication at discounted prices. This medicine used for the treatment of Colorectal Cancer. for purchase Regorafenib Tablets online with delivery facility to countries including USA, UK, China, Russia, Singapore, Malaysia, Hong Kong, Philippines, Africa, Australia, UAE, Thailand and others. 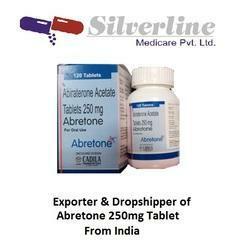 We are the Leading suppliers of Abione 250mg Tablets. 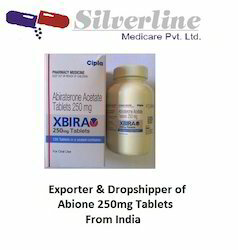 We also do Drop Shipping of Abione 250mg Tablets Tabs. Swelling; feeling weak, feeling very hot; joint pain or swelling; bruising; or cough, feeling short of breath. We are the Leading suppliers of cetate 250mg Tablets. We also do Drop Shipping of cetate 250mg Tablets. Abiraterone Acetate decreased serum and other androgens in patients in the placebo-controlled Phase 3 clinical trials. It is not necessary to monitor the effect of Abiraterone Acetate on serum levels. Changes in serum prostate-specific antigen (PSA) levels may be observed, but have not been shown to correlate with clinical benefit in individual patients. The recommended dose of XBIRA tablets is 1000mg (four 250mg tablets) administered orally once daily in combination with Prednisone 5mg administered orally twice daily. XBIRA tablets must be taken on an empty stomach. No food should be consumed for at least 2 hours before the dose of XBIRA tablets is taken and for at least 1 hour after the dose of XBIRA tablets is taken. The tablets should be swallowed whole with water and not to be crushed or chewed. We are the Leading suppliers of Abstet 250 MG Tablets. 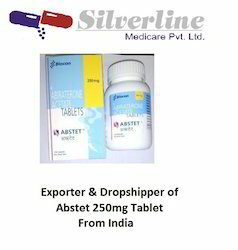 We also do Drop Shipping of Abstet 250 MG Tablets. Abstet Tablet is used for Prostate Cancer, High Blood Pressure, Fluid Retention, Reduced Potassium In Blood and other conditions.Abstet Tablet contains Abiraterone Acetate as an active ingredient. Abstet Tablet works by preventing the formation. The following is a list of possible side-effects that may occur from all constituting ingredients of Abstet Tablet. This is not a comprehensive list. These side-effects are possible, but do not always occur. Some of the side-effects may be rare but serious. Consult your doctor if you observe any of the following side-effects, especially if they do not go away. 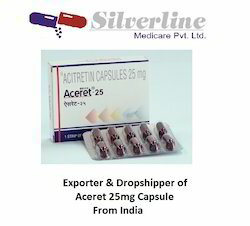 Aceret Capsule is used for Psoriasis, Ichthyosis, Pityriasis, Lichen Rubber and other conditions.Aceret Capsule contains Acitretin as an active ingredient.Aceret Capsule works by reducing the thickening of the skin, plaque formation and scaling. The following is a list of possible side-effects that may occur from all constituting ingredients of Aceret Capsule. This is not a comprehensive list. These side-effects are possible, but do not always occur. Some of the side-effects may be rare but serious. Consult your doctor if you observe any of the following side-effects, especially if they do not go away. Constipation, diarrhea, nausea, vomiting, upset stomach, loss of appetite, body aches and pains, breast swelling/tenderness/pain, headache, dry mouth, scratchy throat, increased cough, dizziness, trouble sleeping, tiredness/weakness, flushing and sweating (hot flashes/hot flushes), vaginal bleeding, hair thinning, and weight change can occur. Changes in diet such as eating several small meals may help lessen the chance of nausea and vomiting. If any of these effects persist or worsen, notify your doctor or pharmacist promptly. Before using this medication, tell your doctor or pharmacist your medical history, especially of: liver disease, high blood pressure, heart disease (such as ischemic heart disease, history of chest pain), brittle bone disease (osteoporosis), blood clots. Trastuzumab for tumors in breast. 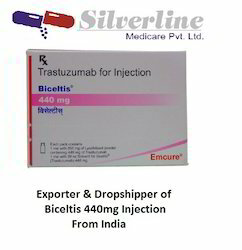 our firm is one of the primary names in industry, participated in processing a wide range of biceltis 440mg injections. We have used in produced these injections and state-of-the-art technology methodologies that make sure their trustworthiness and the best possible quality materials. 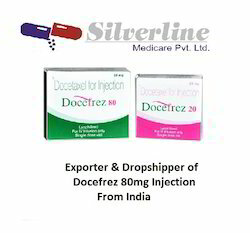 We are the Leading suppliers of Docefrez 80mg Injection. 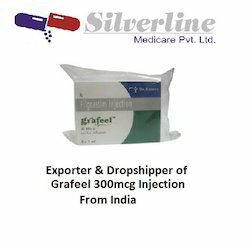 We also do Drop Shipping ofDocefrez 80mg Injection. Find and Book Appointment with Doctors.. Compare Health Insurance Policies.. Do More ! Procarbazine is a chemotherapy drug and is mainly used to treat Hodgkin lymphomas. Doctors may also use it to treat some types of brain tumour, non Hodgkin lymphomas and other types of cancer. It disrupts the growth of cancer cells by stopping the cells from making proteins and DNA. Cancer cells need to make proteins and DNA so they can grow and multiply. 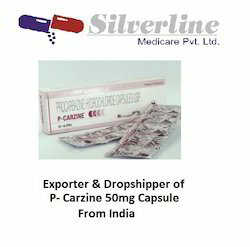 Procarbazine comes as ivory coloured 50mg capsules. Keep them in a tightly closed container, out of the reach of children. You usually have procarbazine chemotherapy as a course of several cycles of treatment. It may be combined with other cancer drugs. The treatment plan depends on which type of cancer you have. For Hodgkin lymphoma you normally take the capsules every day, for 10 to 14 days at a time and then have around 2 to 4 weeks with no treatment. You may need to take different numbers of capsules on alternate days to get the correct total dose. Sometimes the treatment starts with a small dose and your doctor then gradually increases it. It is very important that you take capsules according to the instructions your doctor or pharmacist gave you. Swallow the capsules whole with plenty of water. You should take the right dose, not more or less. And never stop taking a cancer drug without talking to your specialist first. If you take too many capsules by accident contact your doctor, pharmacist or the nearest hospital straight away as this can make you very ill. If you miss a dose, take it as soon as you remember unless your next dose is due within a couple of hours. In this case you need to skip the missed dose and let your doctor know. Don't take a double dose to make up for a forgotten capsule. The side effects associated with procarbazine are listed below. You can use the links to find out more about each side effect. Or go to the cancer drug side effects section. We are the Leading suppliers . We also do Drop Shipping. WARNING: - Samtica is a prescription drug and should be used under proper medical guidance and advice. The information provided here is for general educational purposes only and does not constitute medical or pharmaceutical advice which should be sought from qualified medical and pharmaceutical advisers. Sorafenat (Sorafenib Tosylate) is indicated for the treatment of hepatocellular carcinoma and for thyroid cancer that has not responded to radioactive iodine. Sorafenib Tosylate is a kinase inhibitor. It works by blocking certain abnormal proteins that trigger cancer cell reproduction. 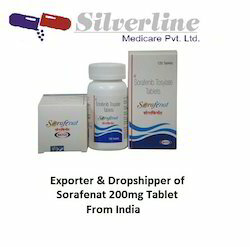 Sorafenat (Sorafenib Tosylate) is indicated for the treatment of hepatocellular carcinoma (a type of liver cancer) that cannot be surgically removed, advance renal cell carcinoma (a type of kidney cancer) and for thyroid cancer that has not responded to radioactive iodine. Sorafenib Tosylate is a kinase inhibitor. It works by blocking certain abnormal proteins that trigger cancer cell reproduction.Sorafenat (Sorafenib Tosylate) comes as a 200mg tablet. Usually it will need to be taken twice daily, but your doctor will provide dosage instructions. Sorafenib should be taken on an empty stomach (one hour before, or two hours after eating). The tablets should be swallowed whole with a glass of water. Continue to take Sorafenib as long as advised by your doctor. Do not reduce the dose or stop taking the tablets if you begin to feel better. Your doctor may adjust your dosage, but you must not adjust it by yourself.Sorafenat (Sorafenib Tosylate) may result in some unwanted side effects. Some are mild and some are more serious. Sorafenib 200 mg soranib tablets. 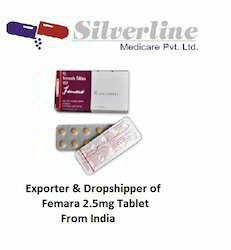 generic nexavar (sorafenib 200 mg) is used to treat cancer occuring in the kidneys (renal cell carcinoma) or liver (hepatocellular carcinoma). It works by inhibiting the action of the enzymes that tell the cancer cells to grow and multiply, while also stopping blood vessels from growing within the tumor, thereby preventing the cancer from growing. soranib (sorafenib 200mg) is a cancer (chemotherapeutic) medication. 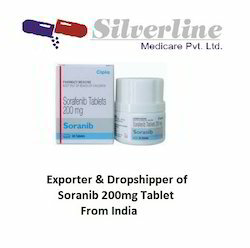 Soranib ( generic nexavar ) interferes with the growth of cancer cells and slows their growth and spread in the body. soranib (sorafenib 200mg) is used to treat a type of kidney cancer called advanced renal cell carcinoma. It is also used to treat liver cancer. soranib tablets (sorafenib 200mg) may also be used for other purposes not listed in this medication guide. possible side effects of soranib (sorafenib 200mg) (generic nexavar tablets)? stop using soranib tablets (sorafenib 200mg) and get emergency medical help if you have any of these signs of an allergic reaction: hives; difficulty breathing; swelling of your face, lips, tongue, or throat. what is the most important information i should know about soranib (sorafenib 200mg) (generic nexavar)? soranib (sorafenib 200mg) can cause high blood pressure (hypertension). Before using this medication, tell your doctor if you have a history of hypertension. Your blood pressure will need to be checked on a regular basis while you are using soranib (sorafenib 200mg). using soranib (sorafenib 200mg) while you are pregnant can cause harm to the unborn baby. Do not use this medication if you are pregnant. Tell your doctor if you become pregnant during treatment. Both men and women taking soranib (sorafenib 200mg) should use an effective form of birth control while taking the medication and for at least 2 weeks after treatment ends. We are the Leading suppliers ofZelgor 250mg Tablet . 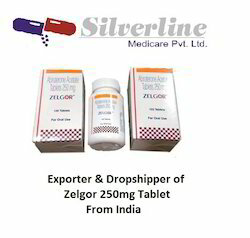 We also do Drop Shipping of Zelgor 250mg Tablet . 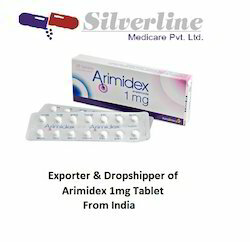 Abiraterone medication is used along with prednisone to treat men with prostate cancer that has spread to other areas of the body and has not responded to surgical treatment that lowers levels. Before taking Zelgor, tell your doctor or pharmacist if you are allergic to it; or if you have any other allergies. This product may contain inactive ingredients, which can cause allergic reactions or other problems. Talk to your pharmacist for more details. Using corticosteroid medications for a long time along with Zelgor can make it more difficult for your body to respond to physical stress. Therefore, before having surgery or emergency treatment, or if you get a serious illness/injury, tell your doctor or dentist that you are using this medication or have used this medication within the past 12 months. Tell your doctor right away if you develop unusual/extreme tiredness or weight loss. If you will be using this medication for a long time, carry a warning card or medical ID bracelet that identifies your use of this medication. 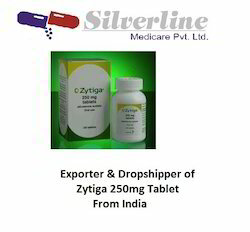 Do not take ZYTIGA® if you are pregnant or may become pregnant. ZYTIGA® may harm your unborn baby. Women who are pregnant or who may become pregnant should not touch ZYTIGA® without protection, such as gloves. Take any other medicines, including prescription and nonprescription medicines, vitamins, and herbal supplements. ZYTIGA® can interact with many other medicines. Take ZYTIGA® on an empty stomach. Do not take ZYTIGA® with food. Taking ZYTIGA® with food may cause more of the medicine to be absorbed by the body than is needed and this may cause side effects. No food should be eaten 2 hours before and 1 hour after taking ZYTIGA®. Men who are active with a pregnant woman must use a during and for one week after treatment with ZYTIGA®. If their partner may become pregnant a and another form of birth control must be used during and for one week after treatment with ZYTIGA®. Talk with your healthcare provider if you have any questions about birth control.High blood pressure (hypertension), low blood potassium levels (hypokalemia), and fluid retention (edema). You may develop changes in liver function blood test. Your healthcare provider will do blood tests to check your liver before treatment with ZYTIGA® and during treatment with ZYTIGA®. We are the Leading suppliers of Pamorelin La 11.25mg Injection. 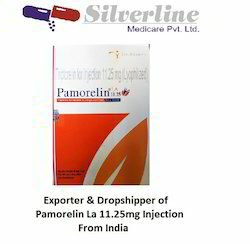 We also do Drop Shipping of Pamorelin La 11.25mg Injection. Pamorelin is usually given once every 4, 12, or 24 weeks. Your dose schedule will depend on the strength of Pamorelin you are using. Follow all directions on your prescription label. Do not use this medicine in larger or smaller amounts or for longer than recommended. Pamorelin is injected into a muscle. You may be shown how to use injections at home. Do not self-inject this medicine if you do not understand how to give the injection and properly dispose of used needles and syringes. Pamorelin is a powder medicine that must be mixed with a liquid (diluent) before using it. If you are using the injections at home, be sure you understand how to properly mix and store the medicine. Do not shake the mixed medicine or it may foam. Prepare your dose only when you are ready to give an injection. Do not use if the medicine has changed colors or has particles in it. Call your pharmacist for new medicine. After your injection, your prostate cancer symptoms may get worse for a short time because Pamorelin raises your testosterone levels. These side effects should get better within 3 or 4 weeks. Call your doctor if your symptoms do not improve, or if they get worse while using Pamorelin. While using Pamorelin, you may need frequent blood tests. Each single use vial (bottle) of this medicine is for one use only. Throw away after one use, even if there is still some medicine left in it after injecting your dose. Use a disposable needle only once, then throw away in a puncture-proof container (ask your pharmacist where you can get one and how to dispose of it). Keep this container out of the reach of children and pets. Looking for Anti Cancer Medicine ?